As it happens, I finished reading this book at about 4.30 a.m. Some hours later, over breakfast, I read that Maya Angelou had died. I haven’t read any of Angelou’s work, but I was interested to see that she had written six memoirs, covering the period of time up until she turned 40. My, I thought, what sort of a life would sustain six memoirs? I had had the same thought when I finished Mandy Sayer’s book, and saw that she had won the National Biography Award and the Age Non-Fiction Book of the Year for an earlier memoir, Dreamtime Alice. 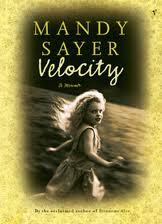 I read this current book, Velocity mainly because I was interested in reading her new book The Poet’s Wife. I’m wedded enough to chronology to want to read the earlier book first, both in its production and in its time span. However, my response to Maya Angelou’s prolific memoir output could apply here as well: what sort of a life sustains three memoirs with how many more to follow? One that has rootlessness and dysfunction at its core, it would seem, along with a strong vein of intelligence and a sense of self that somehow sustains the writer to endure it. This is not to say that I didn’t find it engrossing, because I did. I read it in two middle-of-the-night reading gulps, when I’m not wanting to read anything too taxing. Nonetheless, it was probably an odd choice. In many ways it’s a “look-away-I-can’t-help-looking” type of book, where one bad choice leads to another, and where you’re almost crying out in pantomine-audience style- “don’t do it!”. The violence, both physical and emotional, is not exactly bed-time reading. Each chapter starts with an italicized episode which acts as a sort of preview for something that will arise later on. It was quite an effective technique, although it usually made my heart sink. The rootlessness is laid down in her life right from the moment of conception. Her parents are drifters and party-animals, and after their marriage breaks down, her mother embarks on a series of toxic relationships that culminate in the controlling and violent Hakkim, a younger Lebanese man who Mandy fears. Mandy is shifted from one school to another, as her mother keeps being drawn back to alcohol, depression, helplessness and this evil man. One constant throughout all this is her father, Gerry the jazz musician. It was interesting to read her response to her father’s cleft lip and palate (although she uses the older and more hurtful term ‘harelip’) as I have the same condition myself. She mentions it several times in the opening chapter, and reminds us of it again after she reconnects with him after a long period of time. In fact, at one stage she’d been away from him so long that she found it hard to understand his speech again. Even though she stays with her mother and is dragged from one toxic or vulnerable environment to the next, her father seems a constant source of security, even though he disappears from her life for years at a time, and is in truth just as rootless and unsuccessful as her mother is. Mandy bathes him in an idealized golden glow that he does little to merit. This might sound like a misery-memoir, but it’s not at all. It’s told in a clear-eyed fashion, and while not underplaying the abuse and danger, it does not wallow in it either. I’m certainly up for reading her other memoirs as well. 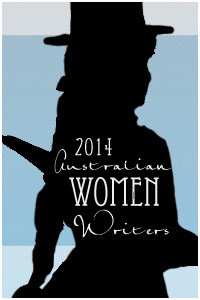 I’ve added this to the Australian Women Writers Challenge 2014. This entry was posted in Australian Women Writers Challenge 2014, Book reviews. Bookmark the permalink. I find with Sayer’s work that she circles around the same themes (in fiction & memoir) all the time without really branching out, & I stopped reading her a while back. I’ve been thinking of picking up The Poet’s Wife though; from reviews I’ve read it sounds like a similar peek-through-your-eyes book. Certainly her novels Mood Indigo and Blind Luck sound very similar to her memoir. I will read the Poets Wife though. I haven’t read any Sayer yet, but have been tempted by The poet’s wife. I’d probably read it cold. (I have though read all 6 of Angelou’s memoirs. She was one amazing woman.) (Were you really up at 3.24am RJ? That sounds even worse than me). Unfortunately! How long the night is! It sure is. I find if I go to bed late, I sleep, but if I go to be early I don’t, so I usually don’t go to bed until 1am or later. That usually does the trick. And I seem to survive on 5-6 hours a night is I get that straight sleep.